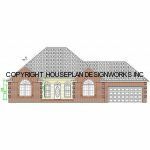 HousePlan DesignWorks, Inc. is committed to providing quality custom house plans at affordable prices. HousePlan DesignWorks is a full service, custom home design service that will discuss with you all of the details necessary to design your custom home to fit the way you live. Your home should have that personal touch that portrays your family's lifestyle and individual personality. Our house plans provide your builder with the detailed information required to complete the construction of your new home or home addition while avoiding costly and irritating mistakes often encountered in this process. Call us today to start working on your new home plans. Contractors- Ask about our builders program. Have you been looking for house plans but still can't find what you want? You're not alone! Are all the plans starting to look the same? Are you to the point where you're ready to buy something that's close so that you can try to get your builder to make the changes or find a local designer to redraw the plans? Don't make that mistake! 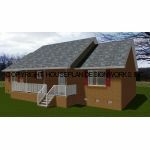 Look at the plans on our site, find a floor plan close to what you want, order the plan to be customized and send us a picture if you want the house to look different from the rendering shown for that plan. A good example may be found in plans P321145 and P321246B You will get a custom plan for a fraction of the normal cost of custom house plans! The prices for this service are conveniently shown with each house plan. We strive to make this experience a pleasant and comfortable one for each of our clients. Let's face it; in this business, word of mouth and referrals are like gold to the house plan design firm, so our goal is to ensure that your buying experience is a great one and the plan you choose is outstanding, as well. We feel that these components provide each of our customers with the ammunition they need to recommend our firm to a friend, colleague or family member without reservation. At HousePlan DesignWorks, we are true to our word and integrity is the foundation upon which our business has been built. All of the house plans on this site started out as custom house plans that we can now offer to you as "stock" house plans. Our selection of well-designed, stock house plans has been produced using Cad software to ensure accurate and detailed information. Our house plans have also been reviewed for structural, as well as aesthetic, value. Each of our house plans can be modified to make it the plan for your home for a small price increase. If you find a floor plan close to what you need, order the house plan with customization and we will change the floor plan and elevations per your specifications. A good example of this may be found in house plans P321602 and P321602B. Please click the link on the left for more information regarding the ordering of custom house plans. All of the house plans on this site were designed to comply with the current building code when they were drawn. We review all ordered house plans for current code compliance and revise if required. If you are going to build in an area that receives heavy snow, or in one that is subject to hurricane force winds, you will need to review the house plans for code compliance. Most of these plans have been built in the greater Charlotte area in North Carolina and South Carolina. If you are located in Charlotte, Gastonia, Concord, Rock Hill, Albemarle, or any of the surrounding areas, please give us a call to set up a meeting. Most of the house plans are also designed for roof trusses and stick framed floor systems. You are invited to create an account with us and receive a Gift Voucher to use toward your first purchase! Contractors, please ask about our builder's program. We'd like to sincerely say "Thank You" from our family to yours. We are here to serve your personal needs, and we look forward to working with you! 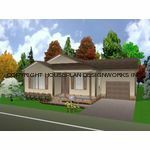 Minimum quantity for "House Plan 321866" is 1. Minimum quantity for "House Plan P321500" is 1.